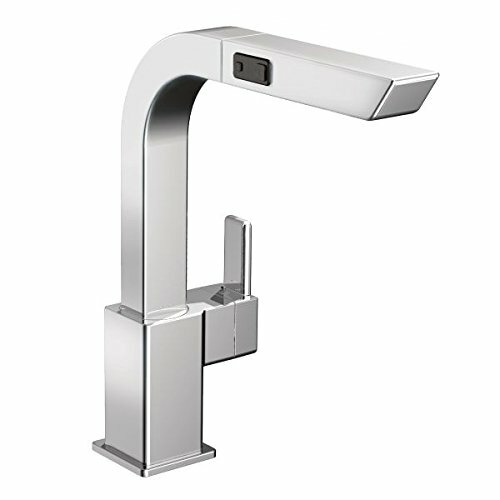 Moen took a rather bold step, design-wise, with their S7597CSL 90-Degree High-Arch Pullout kitchen faucet as this is perhaps the ultimate example of a marriage between a style and a time which are just hard to see coming together. Somehow they’ve managed to do it and they’ve done it quite well. A classic stainless steel color and finish belong, as the name suggests, to a time gone by or a more retro interior style, yet the style of the faucet is a modern one. Granted, this sort of limits the interior in which you can really install this faucet, especially if you are indeed visually conscious about how permanent design elements such as your kitchen faucet look and how they fit in with the overall theme of the style of your kitchen. So although it has a bit of a retro feel to its finish, the solid, geometric-type of shapes used to put the entire faucet together would simply not make sense in one of those kitchen interiors with a so-called quaint charm and character. Yet in a modern interior space, it induces a bit of a nostalgic feel to it – almost like it’s a modern-day take and look into the past. 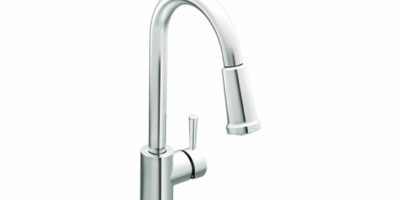 The ultra-minimalist will love what looks more like a piece of art than a kitchen faucet. 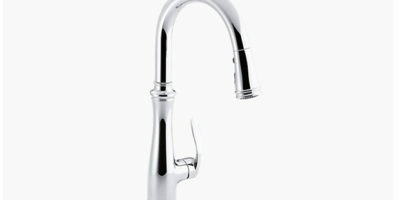 A single handle lever makes this faucet easy to use, with the pull-out spout integrating Moen’s Reflex pull-down system, making this a unique hybrid faucet. Water consumption and flow are at a rate of 1.5 gallons per minute, and the application is through one hole. It’s a compression-based connection, which is where the limitation to only 1.5 gallons per minute is regulated for maximum efficiency. Three function modes are achieved through this collection of features, including an aerated water stream, powerful rinsing, and pause. This is not the most expensive of the best pull-out faucets you’ll find, but it’s not the cheapest either and it’s worth every penny though since it kind of doubles-up as a pull-down faucet as well. It weighs a hefty 8.1 pounds and measures 24.7 x 12.2 x 3.9 inches, which makes its installation a rather delicate process best left to a professional. Otherwise, it’s a deck-mounted faucet which will deliver solid performance once properly secured. Once one is done admiring the sheer beauty of this pullout kitchen faucet, fit for the set of a celebrity home feature, you’ll uncover quite a lot of nifty little functionality features. 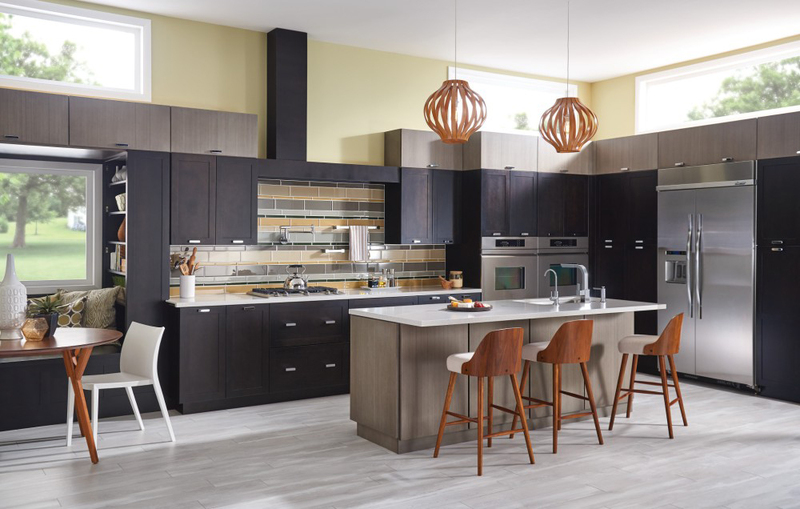 While its 90-degree profile is perhaps more of a visual design feature than one geared towards functionality, the faucet packs some design alchemy under the hood, in the form of the manufacturer’s Duralast 1255 Cartridge. This very simple piece of technology simply ensures the smoothness of the handle when nestled in your hand stays that way for possibly as long as you’ll be alive to use the faucet. The smoothness of the handle and the way in which it moves makes controlling the water flow and temperature extremely precise. 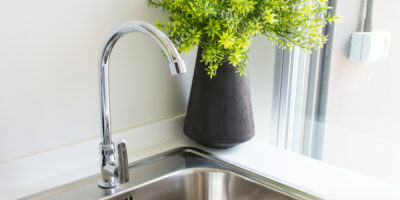 It slips right back into place very easily as well, a welcome feature for homeowners who’ve had to endure some of the pains of dealing with older model faucets. 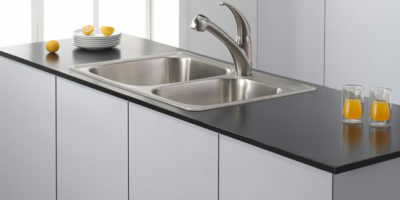 Although this is marketed primarily as a pullout kitchen faucet, Moen’s experimentation with marrying what seems like different features (style) is depicted once again in the functionality. You may as well refer to this as a pull-down faucet as well because it has the functionality of Moen’s Reflex Pull-Down system. It’s definitely intuitive and so it’s user-friendly as well, something which was arrived at from some input from actual consumers and users. The improved unit features an ultra-flexible hose, which is attached to a spray wand that can be moved around, bent, twisted and positioned in pretty much any position you’d ever need a hose to move in. Once you’re finished using it to access the hardest of dirt-concealing areas of whatever you’re cleaning (grillers, pressure-cookers, etc), the hose very easily returns to the originally docked position. You don’t even have to replace it yourself – it’s just a matter of releasing it and it goes back to a position like something made of memory foam. Well, it is made of stainless steel and as “stainless” as stainless steel is, it is rather prone to picking up fingerprints. It’s a simple matter of wiping them off if they do indeed bother you, of course, otherwise, very little maintenance is required with this faucet. Using the pull-down feature also won’t have it look like it’s just been used as a result of the auto-retracting feature.